Telugu Titans are now fourth in Zone B with 33 points from 17 matches. Bengaluru Bulls are fifth with 32 points from 14 matches. Telugu Titans and Bengaluru Bulls played out a dramatic 26-26 tie in a Pro Kabaddi League match on Saturday. The Titans came back strongly in the last five minutes after trailing for majority of the match. Rahul Chaudhari scored eight points for the Titans and created history as he became the first man to score 600 raid points in Pro Kabaddi League. Titans' defence forced as many as four super tackles to claw their way back into the match. For Bengaluru Bulls, Rohit Kumar scored eight points. Vishal Bhardwaj was a rock at the back for Titans and scored seven tackle points. It was a slow start from both teams as it was 1-1 after three minutes. Rahul Chaudhari scored his first raid point in the fourth minute as Telugu Titans 2-1. Ajay Kumar scored with a two-point raid in the next minute as Bengaluru Bulls led 3-2. Rohit Kumar made a successful raid in the seventh minute as Bulls led 5-2. Telugu Titans forced a super tackle in the eighth minute to level the match at 5-5. Telugu Titans forced another super tackle in the 10th minute to lead 7-6. Bengaluru Bulls scored two tackle points in two minutes to level the match at 9-9 in 15th minute. Bengaluru Bulls inflicted an all out in the 16th minute to lead 13-10. Rahul Chaudhari created history as he reached his 600th raid point of PKL as Titans trailed 12-15 at half time. Bengaluru Bulls led 19-14 in the 25th minute as Rohit Kumar scored a raid point. Ajay Kumar made a two-point raid in the 30th minute as they led 22-16. Telugu Titans forced another super tackle in the 32nd minute to trail 18-24. Titans defence were dealing in super tackles as they made another one in 34th minute to cut the deficit to four points. Ajay Kumar made another successful raid in the 36th minute as Bulls led 26-21. 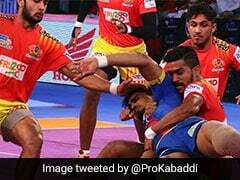 Telugu Titans forced another super tackle in the 39th minute as they trailed 24-26. 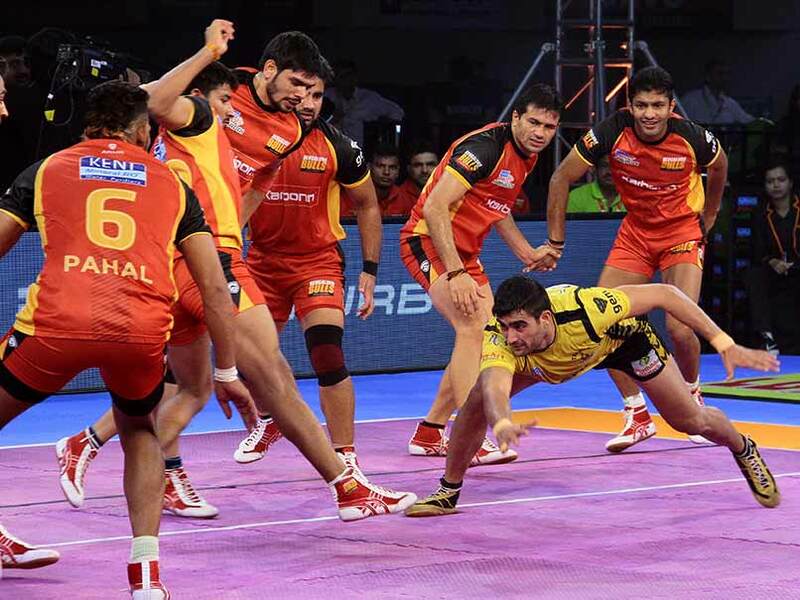 Telugu Titans tied the match at 26-26 in dramatic style as Bengaluru Bulls failed to score in a do-or-die raid.